It's been a winter wonderland around here! Snow has a way of changing the lanscape so much so, that you lose sight of familiar things, until they pop back up in the spring. Here it is in the winter. Wild, right? Remember to consider the seasons in your settings. Imagine what the lanscape would look like if say, your MC was somewhere in January, as opposed to June. Holy crap! I didn't realize Cleveland was THAT cold. Holy Toledo Batman that's impressive. I sit here in awe at the photo. Living in Houston it gets 'chilly' but I use that word very lightly. In Des Moines I'd have to factor in snow. I sort of miss it... until I see pictures like these. Love the frozen lighthouse! Highlighting a season can really add and spice up your manuscript. Does it really look like that? I have been to Niagara Falls dozens of times but several years back we went in the winter. Everything look just like that. Beautiful. I can not believe how much it iced up! Um, that looks like something in a movie where Tom Cruise or Will Smith is going to try to save us from the end of the world. That's one of the coolest photos ever! It definitely looks post-apocalyptic. I am dreaming of Anna Maria Island!! 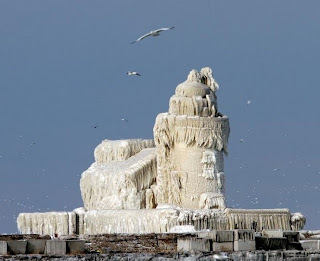 Holy frozen lighthouse! Wow! That is a crazy cool pic! ANd great reminder too!! That is a CRAZY picture! That's an amazing picture, and a great way to illustrate things to keep in mind for writing too. This is stunning. I can't look away! That lighthouse looks intense! That is so cool! I ignore setting way too much in my novel. I need to work on it. WOW...are you kidding? That is so wild and strange looking. What a stunning lighthouse turned ice sculpture! Really, I can't believe that second picture! I would never have thought that a lighthouse would freeze over like that. WOW!!!! 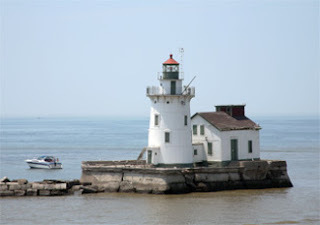 I adore lighthouses! What an amazing sight! Wow, that totally looks like my basement; the water part anyway. thankfully we don't get much snow here!